This story originally aired September 20, 2015. It was a tense moment captured in a photograph that would go on to represent the entire siege at Kanesatake. Freelance photographer Shaney Komulainen was behind the lens of that iconic shot. She had been covering what was happening at Kanasetake over the summer but was on another assignment the day she heard the army was going to be moving in. Komulainen hid her cameras under her coat and snuck in a back way, being dismissed as a local by police. She arrived just as the army started moving in. "The major in charge was walking forward with two snipers on either side," Komulainen recalled. "There was a military photographer walking beside him so they were not going in with guns pointed. They were walking forward slowly and the army just continued to push forward." She said there were about 25 members of the media there and everyone on both sides was used to their constant presence. That is what allowed her to stay so close to the action. 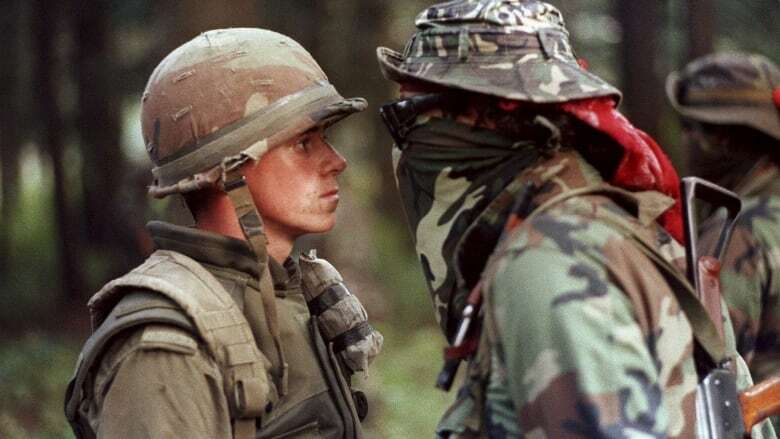 Komulainen said though they were outgunned, the Mohawk protesters decided to approach soldiers individually which is when the face-to-face between soldier Patrick Cloutier and protester Brad Larocque happened. "I shot various photos, various scenes, but I kept going back to this baby-faced soldier because [of] the contrast with his uniform and his face and the scene," Komulainen said. That's a description that irks Rima Wilkes. She's a sociology professor at the University of British Columbia who has spent time studying the photograph that captivated an entire country. Last year, she co-published a study with Michael Kehl in the Journal of the Association for the Study of Ethnicity and Nationalism. It examines how photos don't always reveal the big picture. Part of the issue for Wilkes is how the story behind the photograph played out in the media. One issue was that the protestor was originally misidentified and described as a Mohawk warrior. In fact, Larocque was an Ojibway economics student at the University of Saskatchewan who had come to support the Mohawk people. "If you look at the photo, there are so many elements going on in the photo and there are so many ways that you can read it," she said. Wilkes added that initially, both the mainstream Canadian public and media both latched onto this image because it appeared to show Canada in a peacekeeping role, casting the soldier as a hero. She thinks that over the last 25 years though that perception has changed. "This photo is colonial," Wilkes said. "It's colonial because if you start to look at the elements, it's kind of a misrepresentation of the reality of the situation." Wikes said if you break it down, with each individual representing a side in the struggle, it shows the indigenous man leaning in over the smaller soldier. She said the soldier appears to be unarmed, while the protester's weapon is clearly visible. "So it makes it look like there's this 2:1 ratio in favour of the Mohawks when in reality there were 50 Mohawks, is my understanding, and 1500 Canadian soldiers." Wilkes said what originally compelled her to study this photo was the weight given to what the media tells us, not what it shows. "Imagery is so important," she said. "Imagery is everything."